We need your help to identify the men, women, and children who appear in the photograph. Move your mouse over the image to view a numbered version. Click to view a larger image, which you can magnify to examine the photo in detail in a separate window. 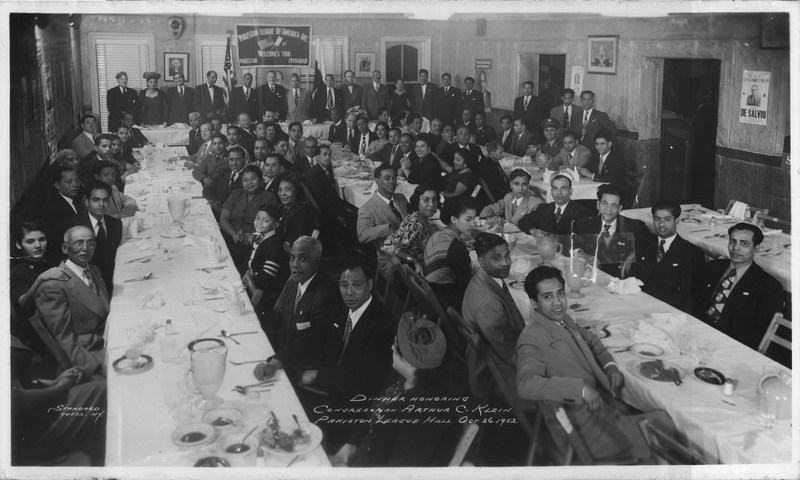 In October 1952, The Pakistan League of America, an organization whose membership consisted predominantly of former seamen from East Bengal, along with their African American and Puerto Rican wives and their children, held a banquet at their Lower East Side clubhouse to honor a local Congressman. This photograph of the event has been provided by Laily Chowdry, the daughter of the Pakistan League’s president, Ibrahim Chowdry (number 78 in the photo). If you recognize any of your relations or family friends, please send a comment using the comment box at the bottom of the page. Please include the identifying number for the person(s), their name(s), your connection to the person(s) you are identifying, and whatever information, stories, or memories you would like to share. If you would like others in the community to be able to contact you, please include an email address at the end of your post, where you can be reached. 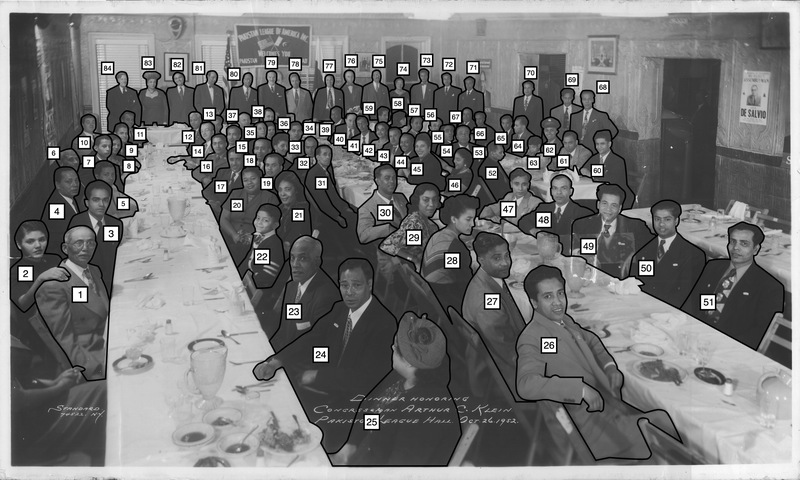 The (perhaps ambitious) goal is to identify everyone in the photograph. #4 is my father, Mohamed Ali. If my memory serves me correctly, my father was the Treasurer of the Pakistan League of America. In October of 1952, I was not even 3 years old yet, so I can’t remember the names of my “Cha Cha’s”, but I recognize #26, #50, #67, #68 and of course #78 which was Ibrahim Chowdry, the President of the Pakistan League of America. He was a very big influence in my father’s life and of all the members of the League. I remember we would always have a New Year’s Eve Parties at the Pakistan League of America on the Lower East Side. The parents were always looking for their children at midnight to give them a kiss, because we were all running around having fun. I am sure there are other children who are now in their 60’s that also remember those happy times. I have 3 of my own personal pictures that were taken at the Pakistan League of America that I will share with everyone. Perhaps you will recognize yourselves or members of your families in the pictures. I recognize my grandparents and mother, # 44 Idris Choudhury, Annie Choudhury and Alice Choudhury. My mom Alice looks so young and pretty in this picture. I was not born when this picture was taken but I vaguely remember going to events like this as a little girl with my brother Charles and my grandparents. What I do remember is the food. The different kinds of curries and dall and roti. I remember that there were so many people at these dinners and the different races of people in attendance. There was a Swedish gentleman named Mr. Sonderson who had close ties to the Pakistani community and was a close friend of my grandparents. I am sure there are pictures of him at these events.